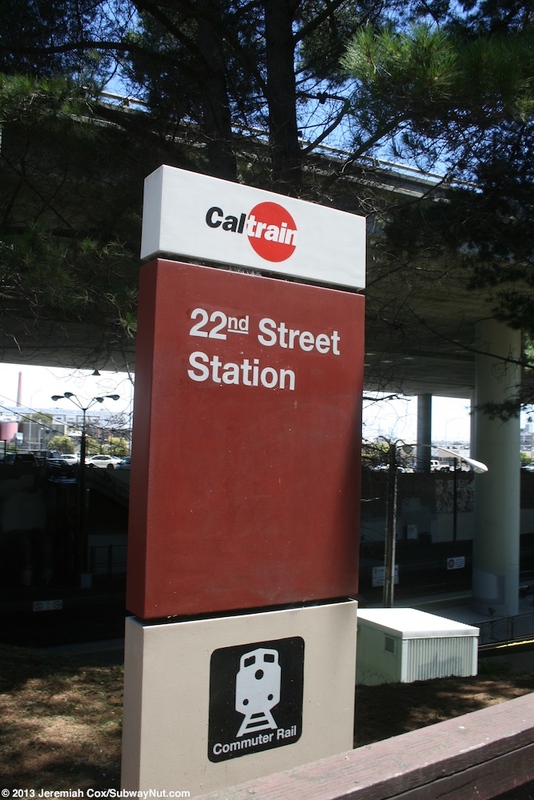 22 Street is the penultimate stop on Caltrain and located in a neighborhood of the City of San Francisco that has a relatively interesting profile of service because of commuters from San Francisco using Caltrain to Commute to jobs down the peninsula and in San Jose. 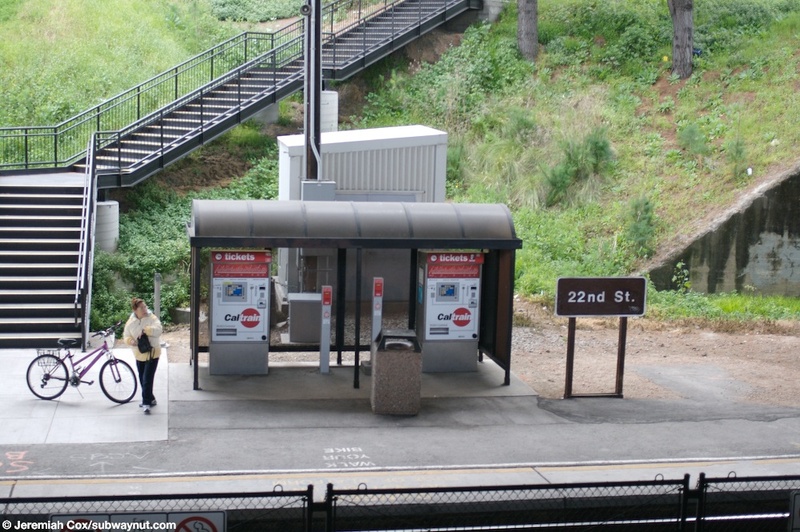 The stop is also in a residential area so the station during rush hours receives the bare bones of service in the San Francisco-bound peak direction (to S.F. 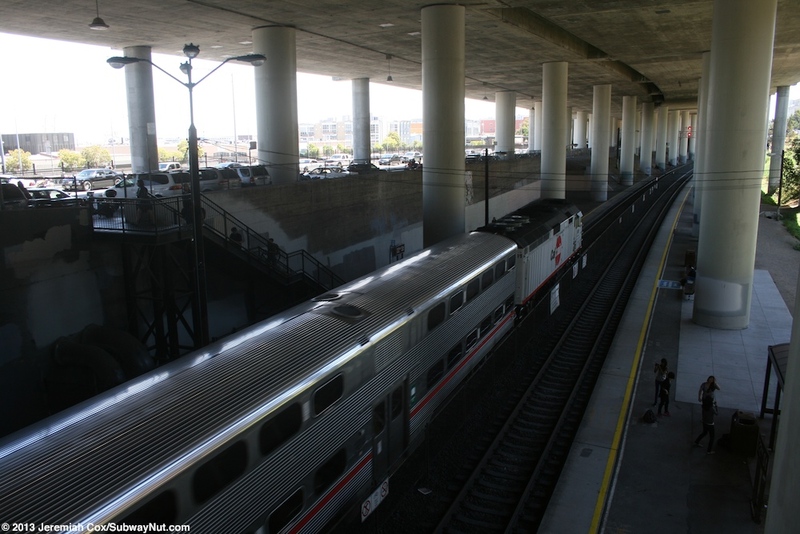 in the AM, to San Jose in the PM) but in the opposite San Jose-bound peak direction service is extremely frequent with all Baby Bullet Express Trains stopping and most Limited trains. 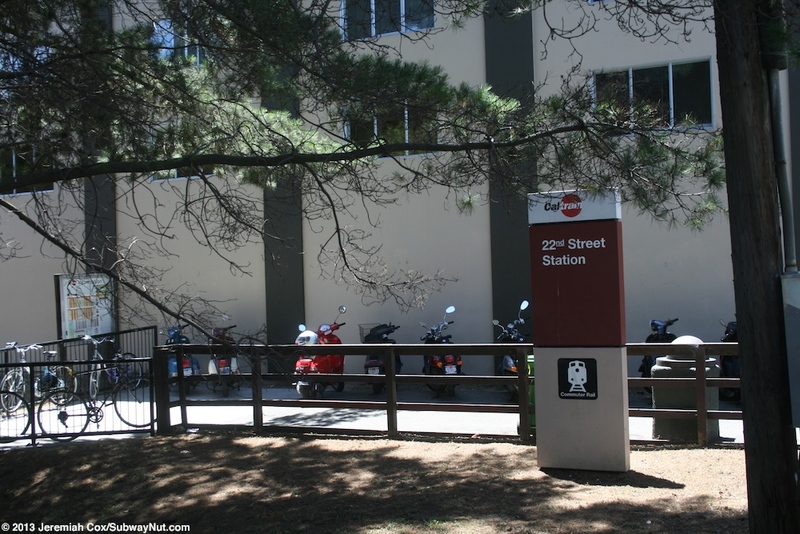 The stop is located in an open cut just south of Tunnel #1, the most northern of the four SP historic tunnels that Caltrain uses through the City of San Francisco. 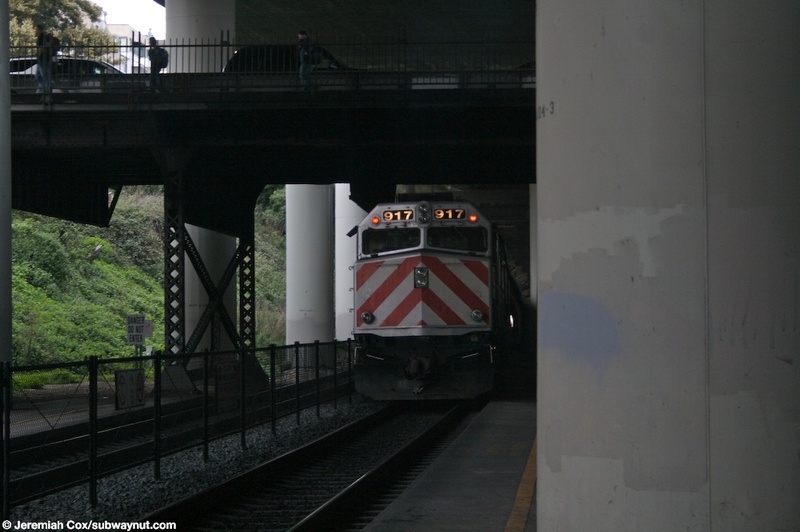 Tunnel #2 is not too much farther south. 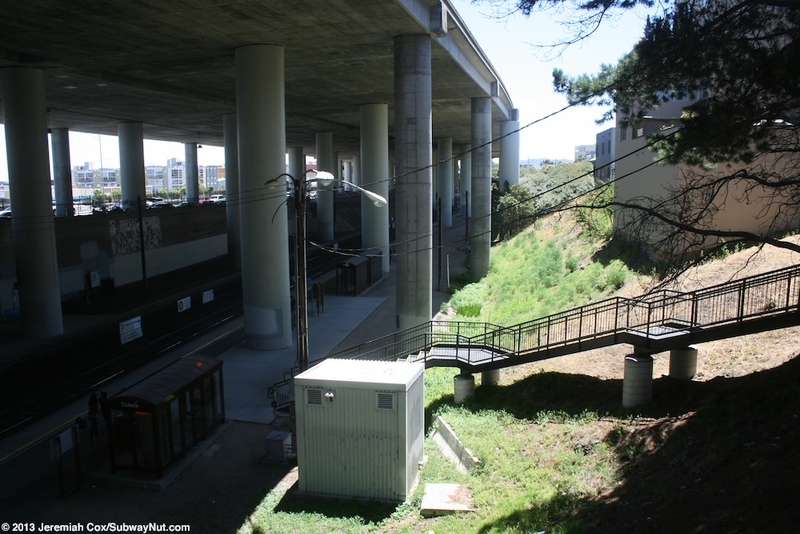 Directly above the station making the stop extremely dark is the concrete viaduct that carries the Southern Embarcadero Freeway (I-280 doesn't actually connect with I-80 that ends at the Bay Bridge because the required spur through downtown San Francisco has not been and will never be built) and is above the Caltrian line and the existing streets (that pass under the freeway and over Caltrain via bridges with no change in grade). 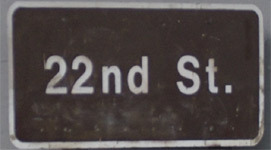 The station has two side platforms for the two track line that begin at the overpass bridge of 22 Street and run south. 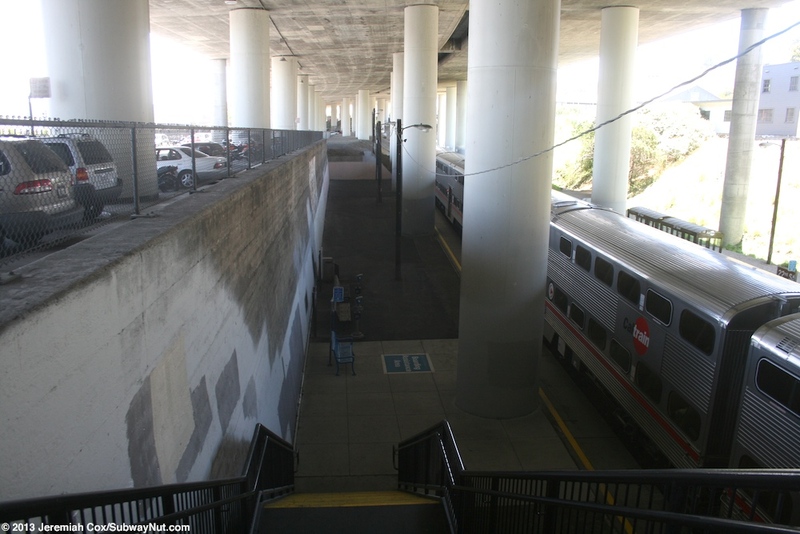 All access to each platform is from a single staircase down to each near this overpass bridge, the one to the S.F.-bound platform is just down Iowa Street, the staircase to the San Jose-bound platform cuts up the grassy sides of the open cut the train line is in giving it some sunlight. 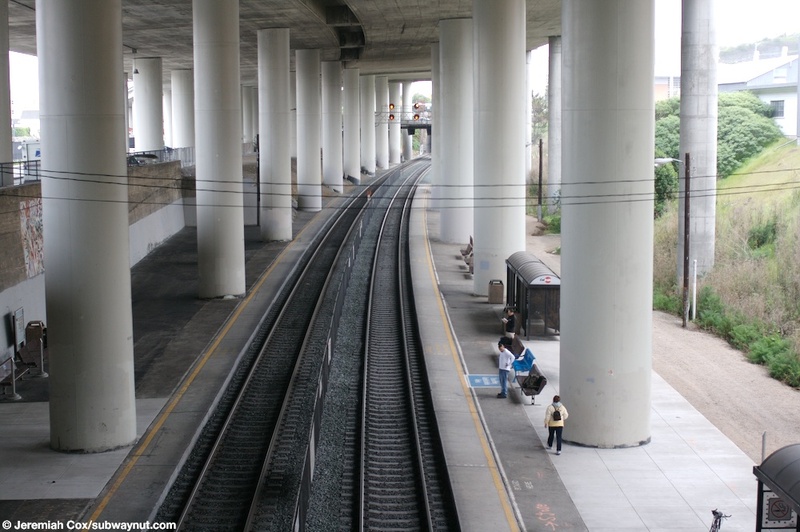 This makes the station one of just two, along with South San Francisco with all day that aren't wheelchair and ADA accessible. 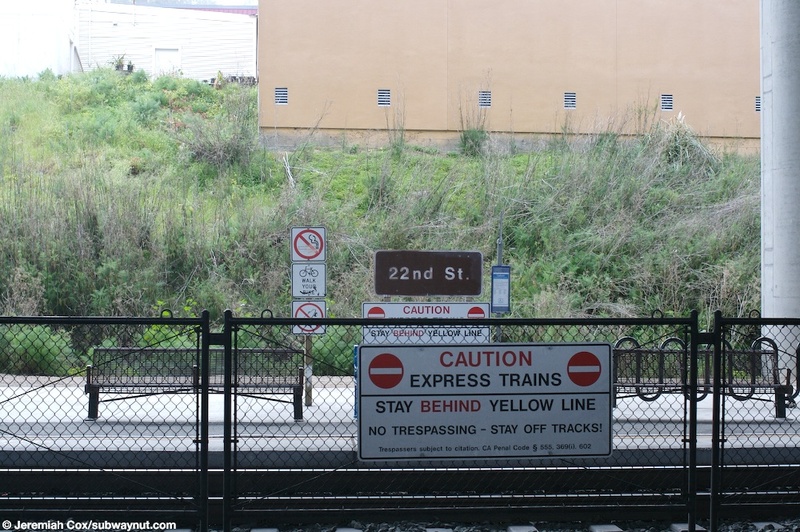 The only signage on each platform are a couple old style brown one with white text (almost like a highway sign). 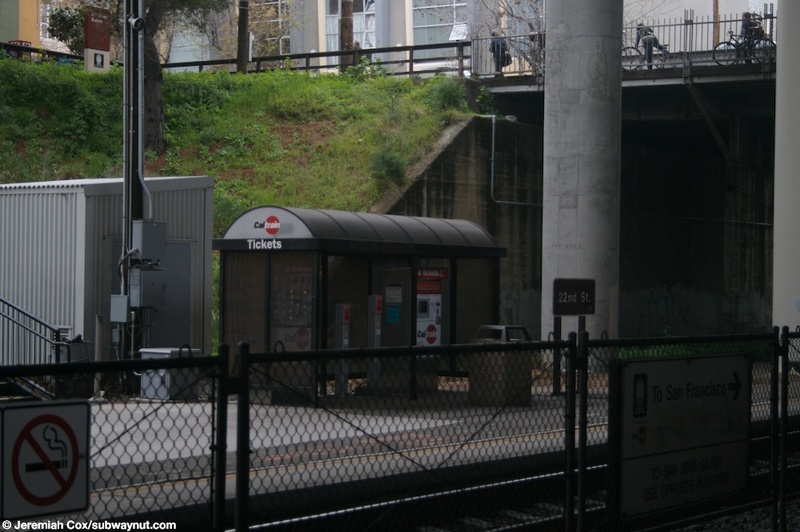 Passengers waiting for San Jose-bound trains have a couple black bus shelters that shelter the TVMs along with a bike rack along the platform. 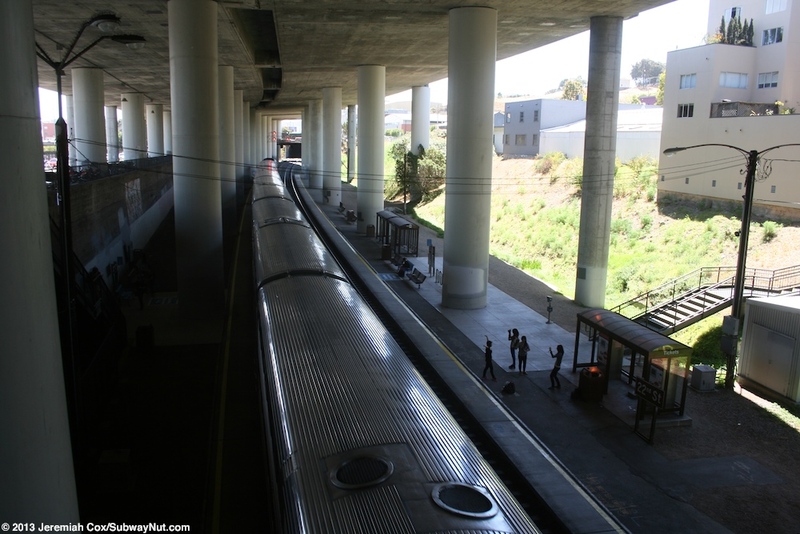 Each platform has a few outdoor benches including a blue 'I need assistance' found at every station although no wheelchairs could board here. 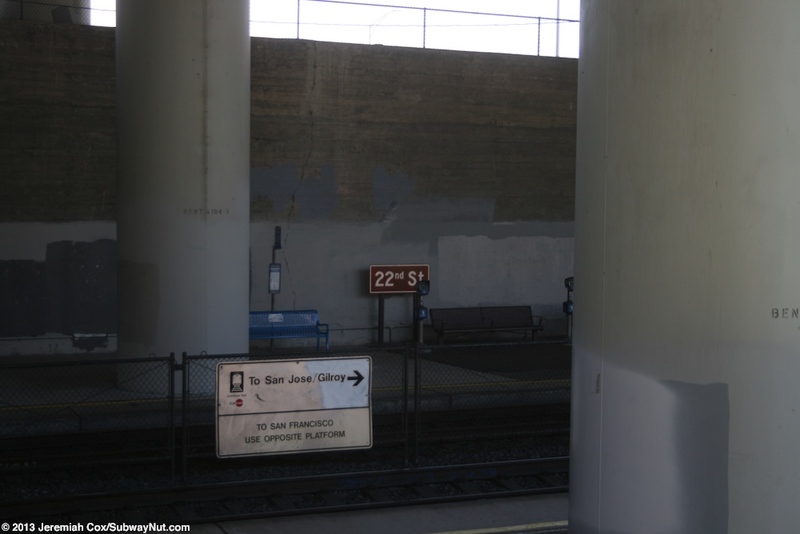 The San Francisco-bound platform lacks any TVMs and just has a couple Clipper Readers (for Tapping Off) along with a couple benches. 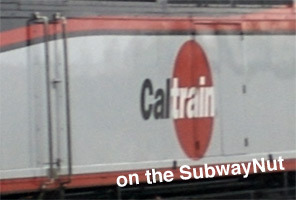 EMD F40PH-2CAT Locomotive #917 pushes a northbound train one final stop to the terminus at 4th & King St out of 22nd St.
Two benches (one is blue for disabled passengers) and a very old ugly brown station sign are the only features of the northbound platform at 22nd St. 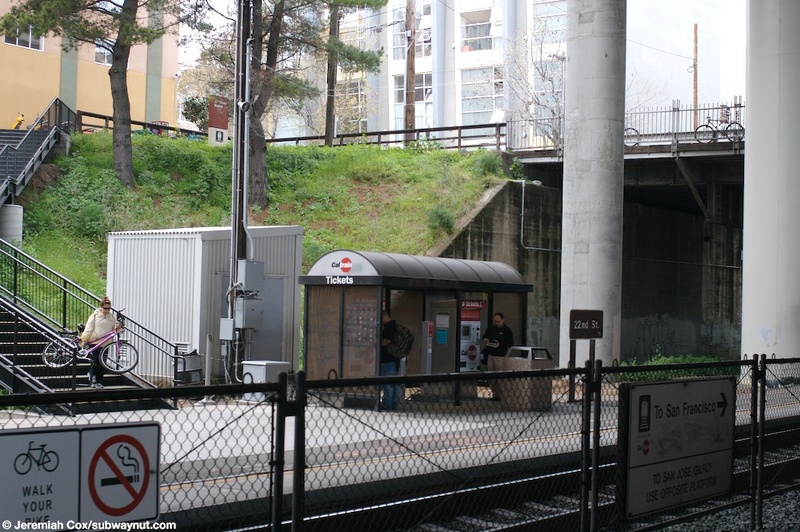 Looking across to the southbound platform at a shelter where the TVMs for 22nd St are. 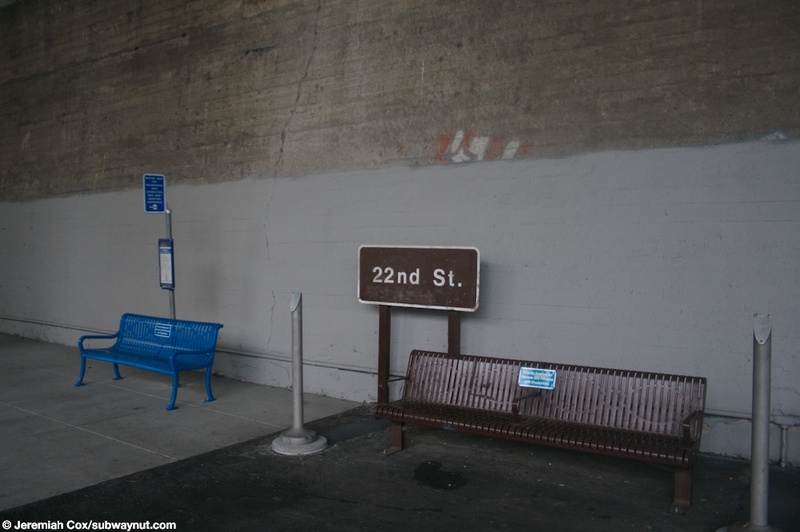 Another view of an old fashioned looking brown sign and benches on the southbound platform at 22nd St.
Two plastic bus shelter type waiting areas on the southbound platform at 22nd St. 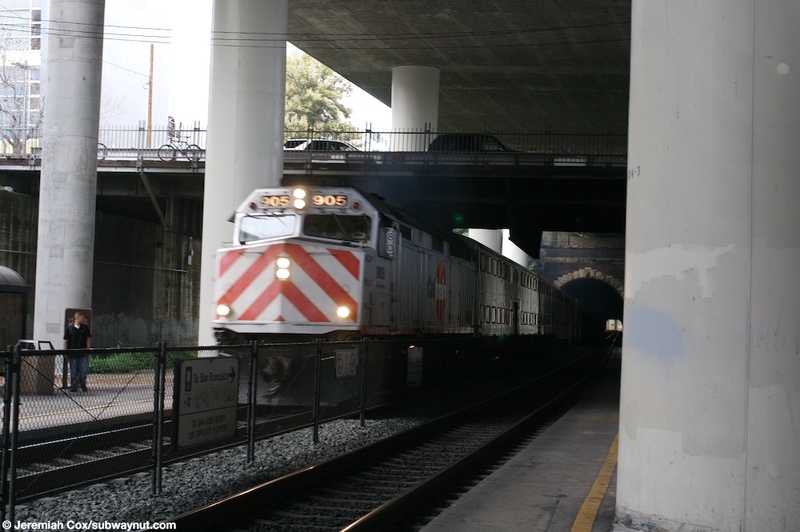 Passengers use the TVMs on the southbound platform at 22nd St.
EMD F40PH-2CAT Locomotive #917 pulls a southbound train into 22nd St to bypass it. 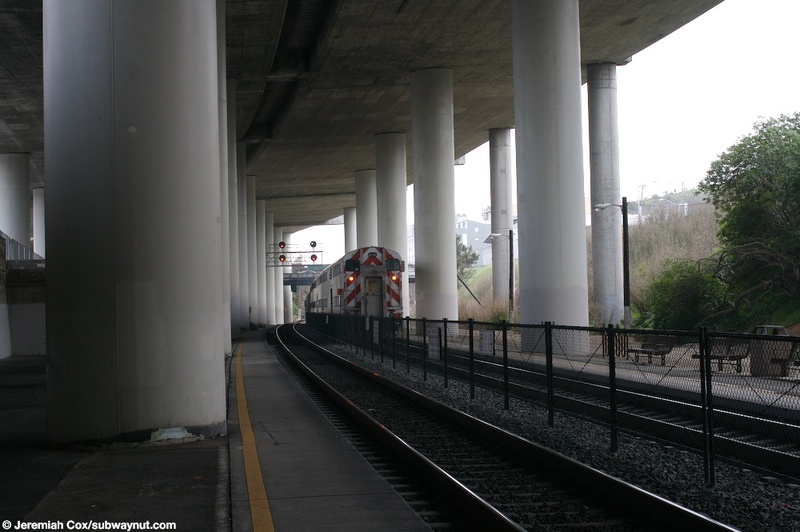 A train of Nippon Sharyo bi-level gallery cars goes south from 22nd St and off into the distance. 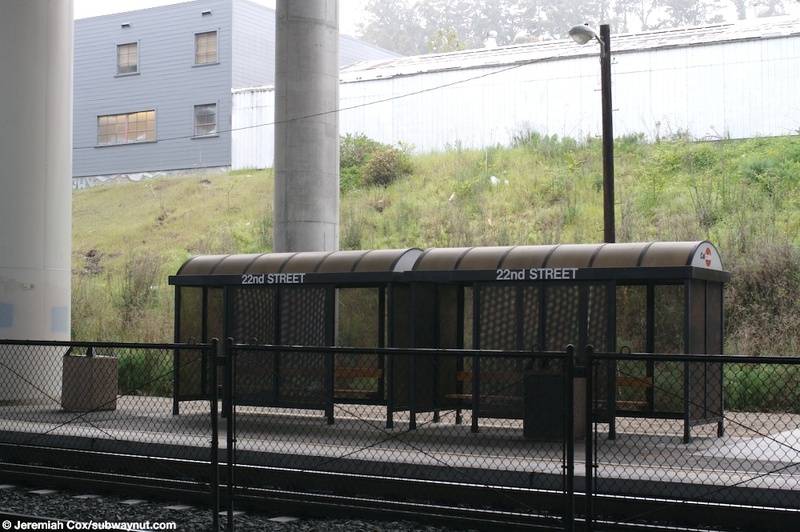 A view of the TVMs on the northbound platform in there shelter at 22nd St and a brown sign. 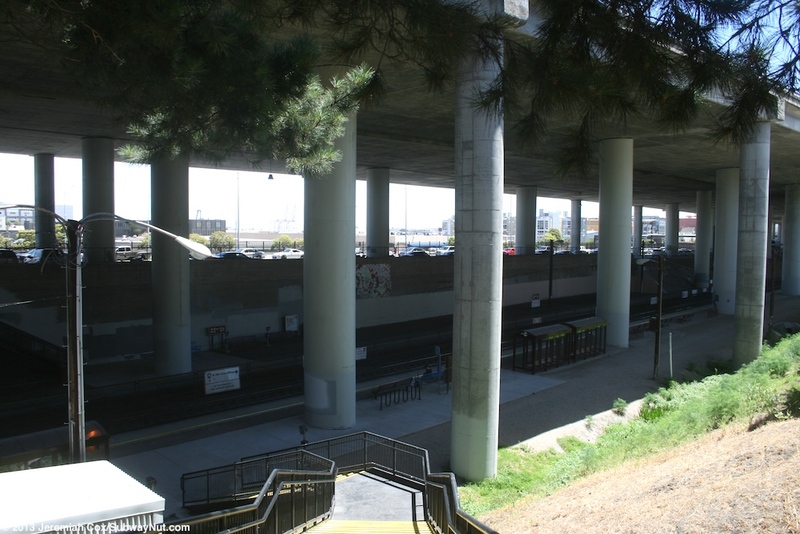 The 22nd Street station has a highway built high above it. 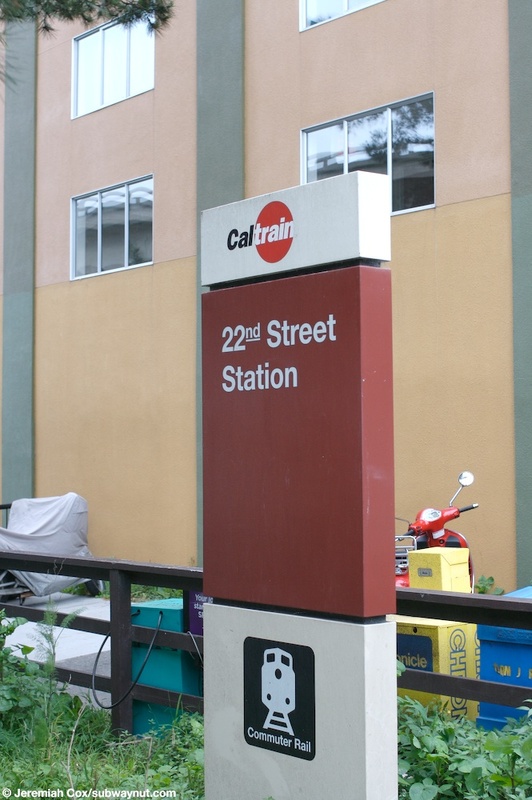 A more modern Caltrain station sign at 22nd Street.